Sunday is Friday in reverse. Most of the people who move in to campgrounds on Fridays move out on Sundays. Kaw Lake is no exception. By 3:00 p.m. the place was nearly deserted again. It was wonderfully quiet, except for one fool fishing (or maybe just tokin’) out of ski boat in the middle of the lake. He was playing music so loud we could feel the bass a mile away. I like to think the fish did too, because it looked like he was getting skunked. Monday dawned bright, cool, and clear without me. I’m retired, see: no more up before sunrise stuff for me! About ten a.m. it felt like time for a shower and shave. While going to the shower house I spotted a huge white bird swimming in the lagoon by the opposite shore. At first I thought it a swan, but then I got a glimpse of that huge golden bill. 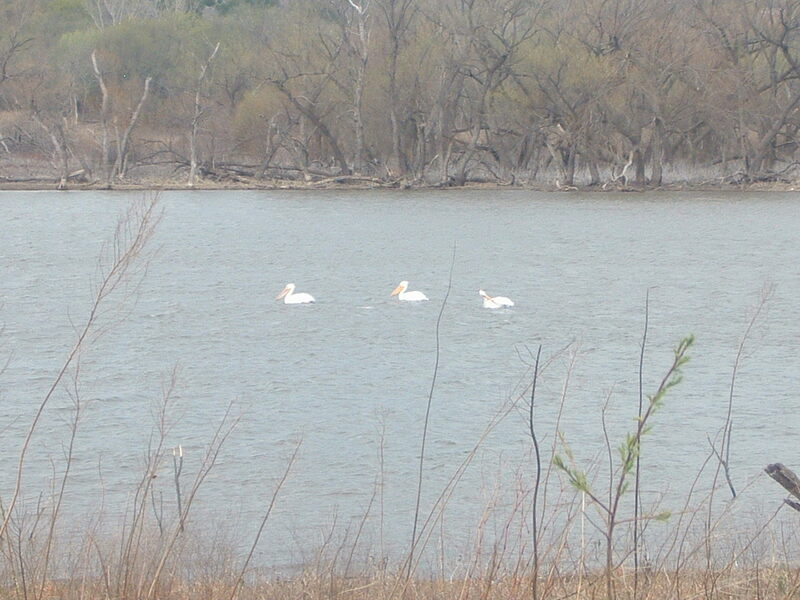 What is an American White Pelican doing in northeast Oklahoma? When I got out of the shower there swam five white pelicans. Back at Kat’s Cradle I grabbed the Kat as a witness and picked up binoculars to be sure. Make no mistake, these are white pelicans. She took some pictures, but our camera has the effective range of a bb pistol, so the pix leave something to be desired. We did some research on the American White Pelican, and here’s what we learned. Like us, they winter from Florida to Mexico along the Gulf Coast. Like us, they pause on their northward migration in the middle Mississippi Valley for three to five weeks, typically beginning around the first of March and leaving in early April for Canada, Minnesota, and as far west as northern California. Up there they nest, while avoiding hurricanes, oil spills, and humidity. These stragglers were catching fish, eating all of them, and doing well at it. They were still fishing when we left for Marion Lake, so we didn’t get to see them fly. Not every day do you see a thirty pound bird aloft.